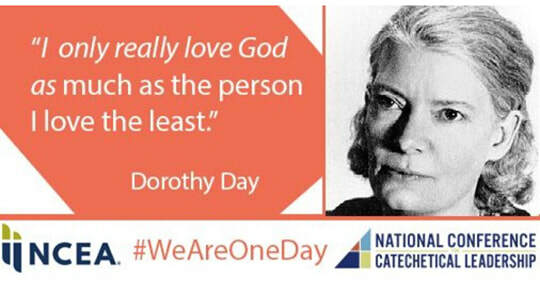 Find Toolkits for One Day for individuals, houses of worship, workplaces, universities, schools and youth groups, and community organizations on the website - WEAREONEDAY.ORG. Sign up here for the NCEA/NCCL One Day webinar. Click here for more information about One Day Against Hate. Click here for One Day Against Hate conversation starters. Click here to follow One Day's Facebook page. Create a safe space for questions. Do you feel welcome and comfortable in a faith community? Why or why not? What role does faith have in how you see and treat others? How does your faith influence how you might respond to hate speech or bigotry? What are the greatest opportunity communities of faith can provide to help combat hatred? Was this conversation helpful? If so, how? What impact did/will it have on you? Are there times you have experienced feelings of anger, bitterness, hatred? Why do you think those feelings surface in you? What helps you let go of those feelings? If someone asked you to name the opposite of hate, what would you say? Is there a Scripture passage – or teaching of the church – that helps you/reminds you to choose love, acceptance and respect over hatred? As you think of the Communion of Saints – living and deceased – is there someone who is a model for you of choosing love and respect over hatred? Is there a Catholic social teaching principle which would undergird our response to working for a culture that is peaceful rather than hateful? How do you respond to Catholic social teaching? Does Catholic social teaching “speak” to the average Catholic? the average American citizen? Within your group (faculty, staff, catechists…), do feelings of anger, bitterness and hatred ever surface? What might bring them about? How do people view you (as faculty, staff, catechists) – as people who unconditionally love and respect or as people who have biases, and – at times, might act out of those biases? What are the ways that hate is lived today: words, actions, …. ? What does Scripture say about each of these? In today’s world, how we do address each of the ways? As a follower of Jesus, how are we called to respond to those who are trapped in their hate? If you were a church with no borders, a community with no borders, a world with no borders, what would that mean? As you become aware of the hatred that seems to be escalating, what might be some possible responses (from you individually, from the group gathered here, from your parish/school, from the church)? What can our country do today to overcome the culture of hate? As a citizen (and Christian) what small (or large) part can you do? It has been said that among the most important thing that adults can do to reduce the spread of hate-motivated behavior is to help young people (and ourselves) learn to respect and celebrate diversity. How do you respect and celebrate diversity? How do you as a group respect and celebrate diversity? The Bureau of Justice statistics states that 61 percent of hate crimes are racially motivated, 14 percent target religion, 13 percent focus on sexual orientation and 11 percent attack ethnicity. (https://www.sanluisobispo.com/living/family/linda-lewis-griffith/article124184039.html) Are there times that you view people who are different as “the other?” How does Scripture and our Catholic tradition nudge and challenge us to see oneness? When have you (individually and communally) been the face of God to someone who is/has suffered hatred and discrimination? In what new, practical way can you (individually and communally) be the face of God in the midst of hatred in today’s world? Have there been movies in the last few years which have addressed the culture of hate? Have any of these movies personified the teaching and actions of the Gospel about triumph over hate? Seth Godin (https://seths.blog/2014/06/treating-people-with-kindness/) says: “One theory says that if you treat people well, you're more likely to encourage them to do what you want, making all the effort pay off. Do this, get that. Another one, which I prefer, is that you might consider treating people with kindness merely because you can. Regardless of what they choose to do in response, this is what you choose to do. Because you can." We are kind, not because others deserve it, but because it’s who we are as people of faith. What do you do when you find it difficult to be kind, accepting, respectful? Make it a movement! Join us and let's make a difference. Use your social media power to start a movement against hate.